The Denis Wick Copper and Aluminium Trumpet/Cornet Straight Mute is a fantastic way to alter the sound and colour of a trumpet or cornet. Recommended by all kinds of top brass players, the Denis Wick straight mute range has become the go to accessory for musicians. Manufactured using traditional hand spinning techniques, absolute precision is guaranteed. 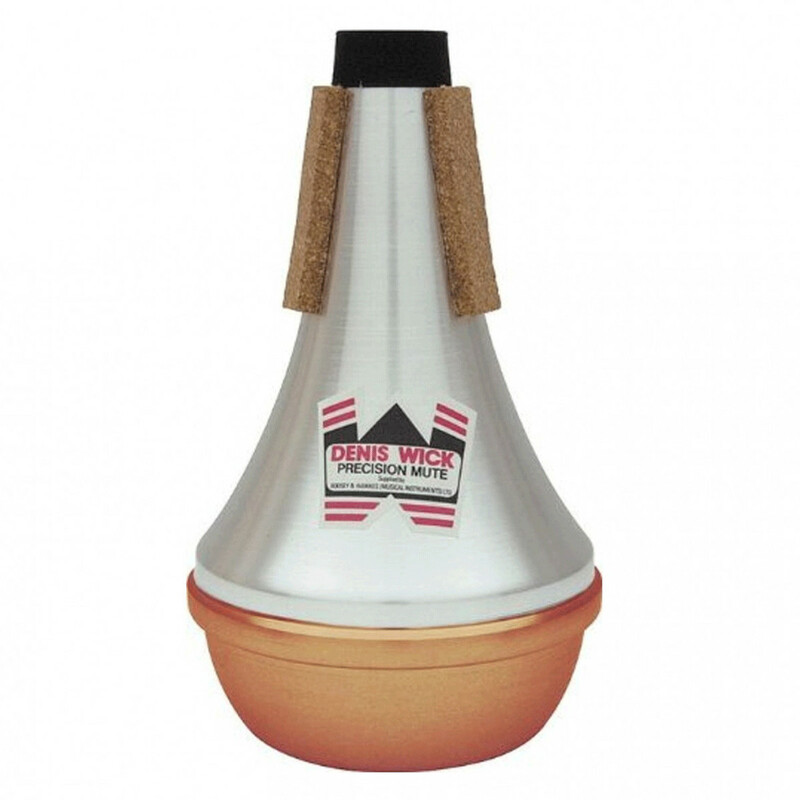 This mute is suitable for both trumpets and cornets. The Copper bottom gives a slightly denser sound, and is preferred for quieter dynamics or symphonic playing. Ever since the design of the Denis Wick straight mute in 1968, it has been a favourite among brass players worldwide. This is due to a number of factors, boasting great intonation, easy to blow against and the ability to hit forceful loud dynamics to name a few. The mute is very open, meaning that the instrument is not restricted by the mute when tucked in to the bell. As opposed to many mutes on the market that silence the instrument slightly when playing, the Denis Wick straight mute allows the performer to keep a full rich sound. Denis Wick's company have stuck with their construction methods from their founded years. Using a lathe spinning technique, the mutes are hand carved to create a 'work-hardened' item. This makes the mute lightweight and easy to use. Real cork is used on the mute to ensure that is provides a snug fit inside of the bell of the instrument at all times. The Denis Wick copper bottom straight mute is a slight variation on the traditional straight mute, manufactured back in the 1960s. The copper material gives a slightly darker sound than the traditional, which makes it great for quieter passages and more mellow moments. It's also great for orchestral performers that require the mute for a more symphonic sound.